On February 7, 2011 the results of the referendum for the self-determination of South Sudan were announced: with 98.83% of the vote, the population voted in favor of independence from the North. After more than 20 years of conflict, the 54th African country, the 193rd in the world, was born. The new state, however, was born ÏnakedÓ, devoid of infrastructure, roads, or health care professionals. While the country is buoyed by hope for a better future, it is however constrained by an only apparently peaceful and stable context. Juba, South Sudan, February 2011 – Juba has been confirmed as the capital of the new country. Since the signing of the Comprehensive Peace Agreement in 2005, this city, located on the White Nile, has been growing progressively. Recent estimates calculate that the city has more than 250,000 residents (5th Sudanese Population and Housing Census, April 2008). This figure is expected to increase. Due to the repatriation plan set forth by South Sudan’s government together with the support of numerous humanitarian agencies, thousands of Sudanese who fled during the conflict are now returning. According to estimates by international agencies, more than 220,000 Sudanese moved from Khartoum to the South between October 2010 and February 2011. Archangel Arob Biong, 53, is biding time at the train station in Aweil, the capital of Northern Bahr el Ghazal State (NbeGS), along with hundreds of other returnees. Together with his wife and four children, he embarked on the journey from Khartoum on one of the two government organized trains together with over 500 people. Living makeshift campsites along the side of the train, many passengers are waiting to continue on to Wau, their final destination. ìI am going back to my land, to my dust,î to a barren land, where Archangel will build his family a new home. The Arob family is one of the more fortunate ones. They packed an entire railroad car in Khartoum with many of their belongings, twenty years worth of life as refugees. They are waiting. A policeman seated along side the tracks hypothesizes that ìtomorrow morning they will departî. No one knows for sure. The dozens of families here are waiting in dusty improvised campsites. The wait is made more difficult by the torrid heat and the lack of basic goods, such as food, water, and basic health care and services. They have been left to their own devices and an uncertain future. Their only certainty is what they left behind in the North, what comes next is completely unknown. Some are waiting to register with the authorities. Others who already have are waiting for relatives to arrive with makeshift arrangements for their transfer to new settlements. 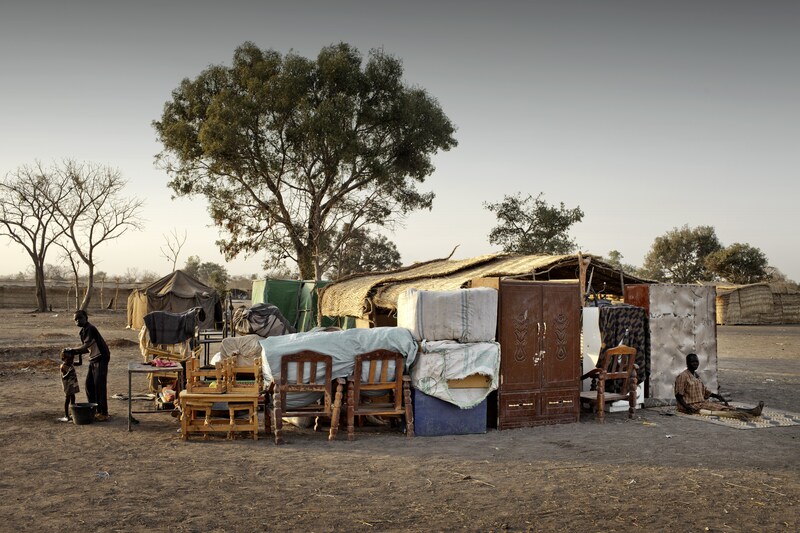 Most of these settlements are temporary, like the one in Apada, about 8 miles from Aweil. On the plane to Aweil, a Kenyan UNHCR employee informally shared that “Officially, they will not be called Internal Displaced People camps. These are temporary settlements.” The site is crowded. Every family has tried as best as possible to create a comfortable environment for themselves by placing their belongings in an orderly fashion: beds frames, sofas, cupboards, bicycles. The furniture is placed in rooms without walls. Apada is dusty, as is the rest of South Sudan. It has no facilities nor water, and there are only a few latrines. But there is plenty of space for all the second and third generation refugee families that are pouring back in to NbeG State, such as Agul Kon Tong’s family. She is originally from Aweil, having fled 12 years ago, and has now been in Apada for one month, waiting to rebuild a life with her four Khartoum-born children in tow. Her husband stayed up north. Many families were separated during the exodus, others during their return: in some cases the men have gone back first in order to set things up for the return of the women and children. In other cases, such as Agul’s family, the women and children have returned first, while husbands and fathers continue to work in the North. They call them returnees, yet many of their children, were born and raised in the North, probably do not even speak the local dialect. It’s a waiting game. Dominic Deng, an Aweil native, accompanies us and translates Agul’s words of concern. Dominic has been training at the hospital in Aweil since qualifying as a Clinical Officer at the National Health Training Institute (NHTI) in Maridi, run by AMREF since 1998. It is the only institutional training for Clinical Officers in South Sudan. 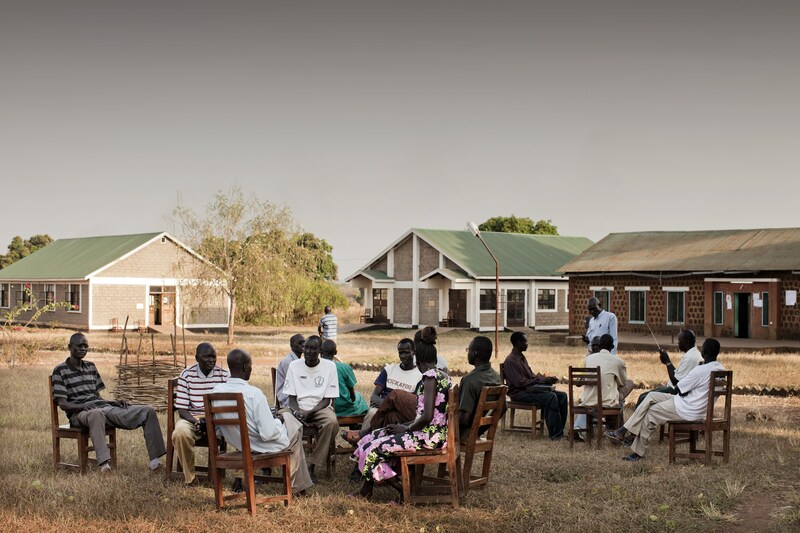 Clinical Officers represent the ìDoctors of Southern Sudanî: they offer 60-80% of the services provided by doctors, and their training takes less time and is far less expensive. According to the Southern Sudan Medical Journal mapping results (Mapping the Specialist Medical Workforce for Southern Sudan – January 2010): ìIt is estimated that there are approximately 500 Southern Sudanese doctors with basic medical degreesî. For a population of about 10,000,000 people, the number of specialists from South Sudan working there does not meet the WHO (World Health Organization), minimum standard of 20 doctors per 100,000 inhabitants. Dominic, like Agul, belongs to the Dinka tribe, the predominant tribe in Southern Sudan. He spells out the woman’s concerns. “The child is sick but she does not want to take him to the hospital. She is waiting for the hospital to come here.” The hospital is not far, but travel is difficult if not impossible, and while the hospital cannot move to Apada, the mobile clinics of the IRC (International Relief Committee) will be providing primary health care to the returnees in the settlement. Most health services are provided by NGOs (Non Governmental Organization), with the support of international agencies. IRC also runs the Primary Health Care Centre (PHCC – health facilities located in hard-to-reach areas that are meant to meet the primary health care needs of rural populations) in Mualalkon. 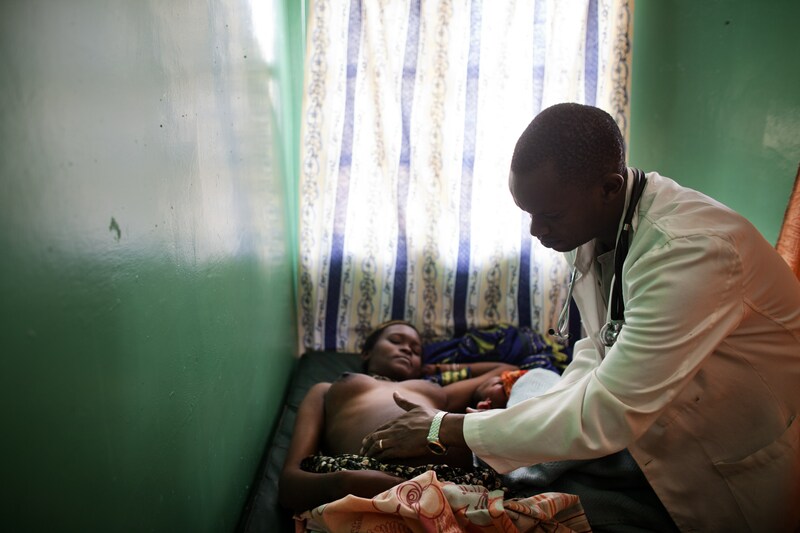 James Kon Kon, 32, who graduated as a Clinical Officer from AMREF’s NHTI in Maridi, works there. James is originally from NBeGS; just like Dominic, he returned home to provide his services upon graduating. John Akoz Tong, manager of the PHCC, is also among the first graduates of the AMREF’s Clinical Officer, class of 2001. 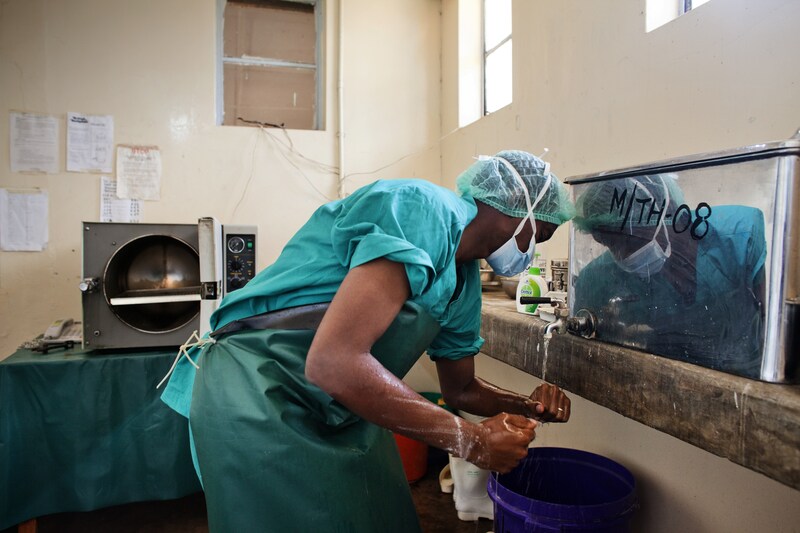 Ever since graduation John has continuously worked to better the health of Southern Sudan. He gives a realistic analysis of the situation. The most common diseases are also the most easily preventable and treatable. Malaria, meningitis, measles, yellow fever and pneumonia. Today we are also witnessing a resurgence of diseases such as leprosy, cholera, polio, as well as tropical diseases such as river blindness, sleeping sickness and guinea worm”. He also mentions the non-existent health care system, ill-equipped facilities, and lack of medicine, as well as the shortage of local, trained health care providers. 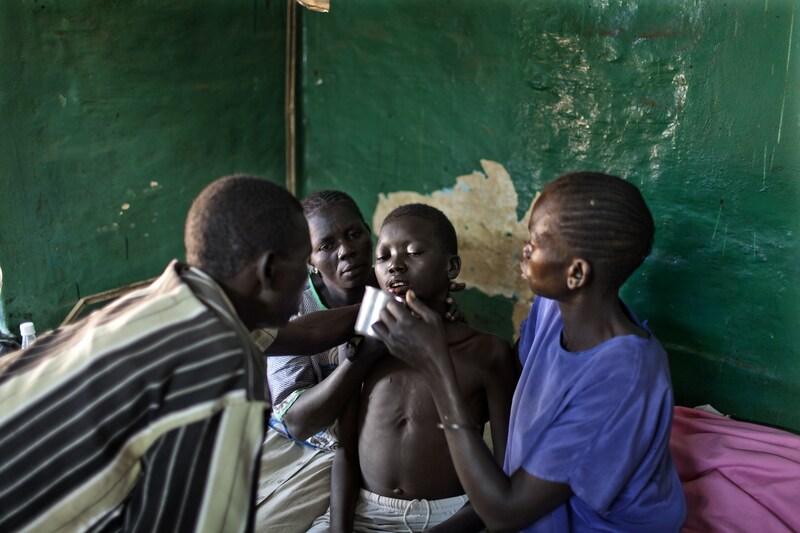 The lack of doctors and paramedic personnel in South Sudan, as elsewhere in Sub-Saharan Africa, is due to several interrelated factors: under-investment, the high migration rate of those trained, and pandemics that regularly sweep throughout the area. Limited health care personnel training programs and low salaries for medical staff are the forces that drive locally trained staff to emigrate from Africa. The health care system is poorly distributed. Rural areas pay the price for this the most, Areas such as Malualkon are served much less than urban areas. Another south Sudanese challenging portrait, the limited access to needy populations, due to still frequent intra tribal conflicts in addition to non-existent or extremely poor road networks curtail movement. Aweil is a hot zone, given its proximity to the border and to the still disputed oil rich region of Abyei. The referendum to determine whether it will join the North or the South has been postponed. However, health care is at least available there. James Aguer Diing, 33, Clinical Officer, works at the city’s Civil Hospital, managed in part by MSF (Medecins Sans Frontieres). 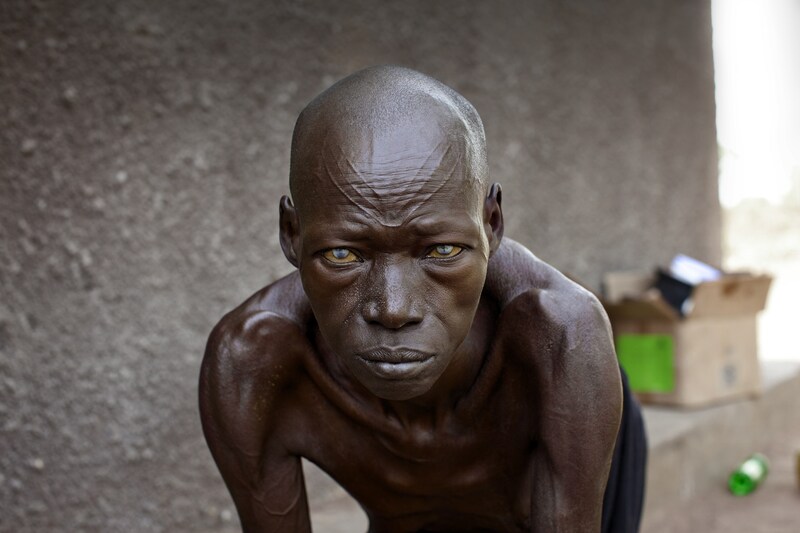 James is a “lost boy” of South Sudan. In 1989 his father, a member of the army, forced him to flee. Together with other 20.000 children, at eleven he walked to Ethiopia, where he lived without his family in the Pinyudo refugee camp for four years before returning and studying to become a Health Worker. He ended up receiving his diploma in Maridi. While the northern part of the new country is crowded with returnees and humanitarian agencies, the areas further from conflicts past or present are much less adequately served. These areas are often remote and inaccessible, such as Terekeka county. The old colonial road is impassable, after being mined and then abandoned for 20 years after the siege of Juba. Many areas have been cleared of mines, while many others are still high-risk areas that contribute to a downturn in return settlement and development. To access Tali one must go through land that becomes muddy and swamp-like during the rainy season. Here too, health services are provided by a PHCC, managed by AMREF. Janet Mandera, 25, who graduated as a Clinical Officer in Maridi, welcomes us. Janet is one of the few female Maridi graduates. Both the social status and the health of women in South Sudan is very poor: only a few meet the minimum educational requisites to enroll in the three-year course. At this PHCC there is no bustling activity. The clinic is silent, people move slowly between the OPD (Outpatient Department) and pharmacy. “It’s because it has not rained,” says Janet. “Most of the inhabitants of the area are shepherds who travel with their herds during the dry season. When the rains come, activity increases, mainly due to malaria and pneumonia.” This nomadic lifestyle and geographic isolation are challenges that Tali faces during the rainy season. “The medical facilities are essential for health, but they literally cannot move. It is necessary for us to go to the communities during the dry season, rather than mobilitate them to come here,” says a Comboni Brother. The Comboni Missionaries are among the few who share the isolation of Tali with AMREF. Following a monthly schedule and traveling via motorcycle, PHCC health care workers reach the communities and their flocks to administer preventive and primary care. This is the only way to build a health care system in a country characterized by hard to reach areas inaccessible for up to six months a year due to heavy flooding and inhabited by such diverse peoples. According to UNOCHA (United Nation Office for the Coordination of Humanitarian Affaire), Terekeka county (Central Equatoria State – CES) has received about 730 returnees, a small number compared to other areas such as Unity (52.244) and NBeG (45.839). This is mainly due to its distance from the border. Such a trend is not reflected in Juba (CES) county, which has seen about 7,000 people return. It is likely that many refugees will decide to settle in urban areas where services and infrastructure are more developed, despite the cost of living being much higher. “I have been working at the Juba Teaching Hospital for more than ten years,” says Rose Poni, a nurse. “The International Committee of the Red Cross (ICRC) used to run the hospital during the war years. In 2007, once peace began to progressively take hold, it pulled out as per its mandate. Since then the situation has gotten worse. Medicine and staff are lacking.” Rose received her Community Health diploma in Nairobi at AMREF’s International Training Centre. Today she leads the Pre-Natal Health Care classes at the Maternal and Child Health Ward. The government hospital in Juba is larger and better equipped than the government ones in semi-urban Yei (CES) and Maridi (WES). However, they share many of the same difficulties: chronic lack of equipment, medicine, supplies, and above all lack of adequately trained medical personnel. This is confirmed by Oneasmus Moro Emmanuel and Basil Sam Benson, both graduated at the AMREF’s NHTI in Maridi, currently assigned to the Yei hospital. Due to these limitations, patients tend to avoid rather than frequent the health care facilities. “I brought my wife to the hospital to give birth. I wanted to be an example to my village,” says Oneasmus. Together with AMREF, over the past 13 years the Institute in Maridi has trained over 230 Clinical Officers which constitute more than half the total number of Clinical Officers working in the country. However, much still remains to be done: Sudan is currently ranked 154th out of 169 according to the UNDP 2010 Human Development Index. 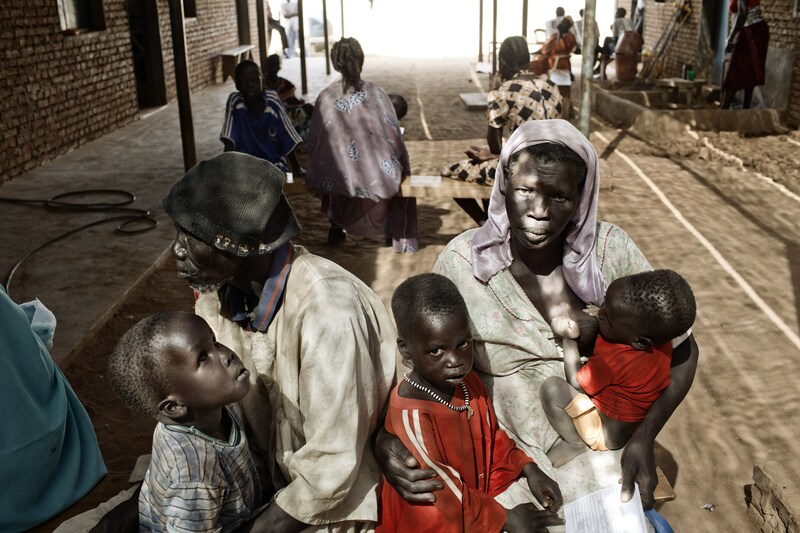 The National Household Baseline Survey of 2009 estimates the poverty rate of southern Sudan at 50.6 percent. Thirty-eight percent of children under 5 are underweight; infant mortality (<5 years old) sits at 10.9%; maternal mortality is 450 deaths for every 100,000 births (2009 World Health Statistics published by the WHO – World Health Organization). Another consequence of such instability is the urban water supply, now unofficially contracted out to Ugandans. Tap water in many parts of Juba is not available. There are tanks where people store water from the White Nile, whose macro management, perhaps even more than oil, is a contended subject for many East African countries. But for James and his “Kampala” colleagues today, the river is simply good business: they supply water to many public offices and private businesses in Juba. They get around by bicycle, carrying 6 to 10 yellow jerry cans. When empty, they pedal easily towards the Nile; once filled, they laboriously drag the bike through town, seven days a week, from sunrise to sunset. The cost of their service depends on the distance covered, usually between 4 to 8 SSP (South Sudanese pounds). They stay a few months to a year, live modestly, and make a tidy sum which they then bring back home to Uganda. “Welcome to country number 54 of African Union,” reads the giant sign at one end of the Juba Bridge over the Nile. Beneath the sign, the group from Kampala fills jerry cans and continues with its deliveries. Run-down health care facilities, the poor transportation network, insufficient staff levels, and lack of supplies and equipment all contribute to inadequate access to and utilization of quality health care for rural communities. These factors drive the great demand for outreach services. Rural health care facilities face a high turnover of doctors and other qualified health workers due to difficult conditions that make long-term commitment and involvement unattractive to health care specialists. The African Medical Research Foundation’s (AMREF) Outreach Programme serves more than 150 rural hospitals in Eastern Africa. Rural hospitals are visited by the Outreach Programme two to six times a year in order to provide specialized health care services to under-served communities. The Outreach programme uses AMREF’s light aircraft on planned, regular flights. Hospitals located in outlying areas are placed on “circuits” which are grouped according to five tertiary hospitals. Specialists are drawn from AMREF and from the university teaching hospitals in Eastern Africa. The twenty three types of specialists are selected based on the requests from the rural hospitals. Thanks to AMREF’s Outreach Programme, more than 20,000 patients are seen and more than 3,000 operations are carried out each year. Flying for health in Africa. There is already plenty of activity by nine a.m. at AMREF’s hangar at Wilson Airport. An engineer who has been with AMREF for 33 years and his assistants are working to get a plane back in the air, while others prepare the planes that will be involved in the Outreach Programme tomorrow. OUTREACH: this is the heart of AMREF’s work. It is the flagship programme in the long history of this organization, born in Africa to provide health in Africa. The Flying Doctors’ mission has been on-going, uninterrupted for 54 years now, ever since Michael Wood, a British doctor on a mission in Kenya in 1957 noted that “In Africa, if we wait for the patient to come to a hospital, the patient dies. Instead, we must bring the doctor to the patient.” Since then little has changed. Eighty percent of the doctors in the country serve the twenty percent of the population that is in or close to urban areas. This means that the roads, or the skies more precisely, that have yet to be travelled by the Flying Doctors are truly endless. The Flying Doctors consist of over 300 professionals who offer their services to AMREF’s cause: to bring health care to those who do not have it and who cannot reach it. The Flying Doctors carry out short missions – one week, two or three times a year – in Kenya, Uganda, and Tanzania, to remote areas that lack health care facilities and which can often only be reached by air due to roads that are either impassable or missing altogether. In this way, these medical specialists are able to provide health care by getting as close as possible to remote East African populations. Preparations are under way at AMREF’s operational offices at Wilson Airport. The bags are packed with drugs and other medical supplies needed in the coming days. Each bag has its own destination – Wajir, Mandera, Moyale, Marsabit – and contains drugs and other materials for operating rooms. 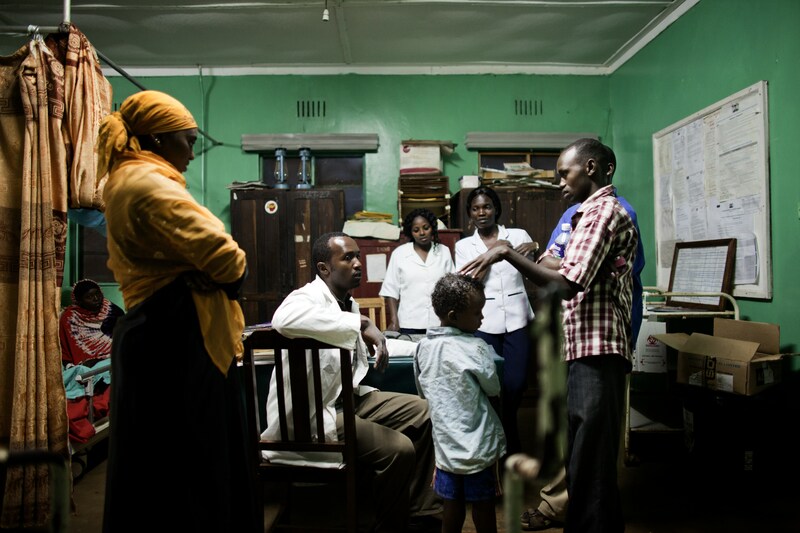 Relatives at the Yei Civil Hospital assist a young patient, who suffers from malaria. 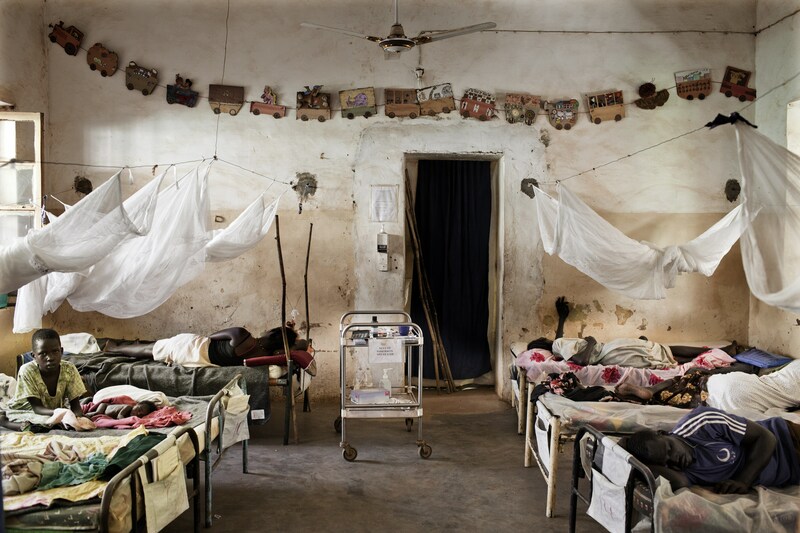 Women lie in their hospital beds at the MSF (Médecins Sans Frontières) managed Civil Hospital. 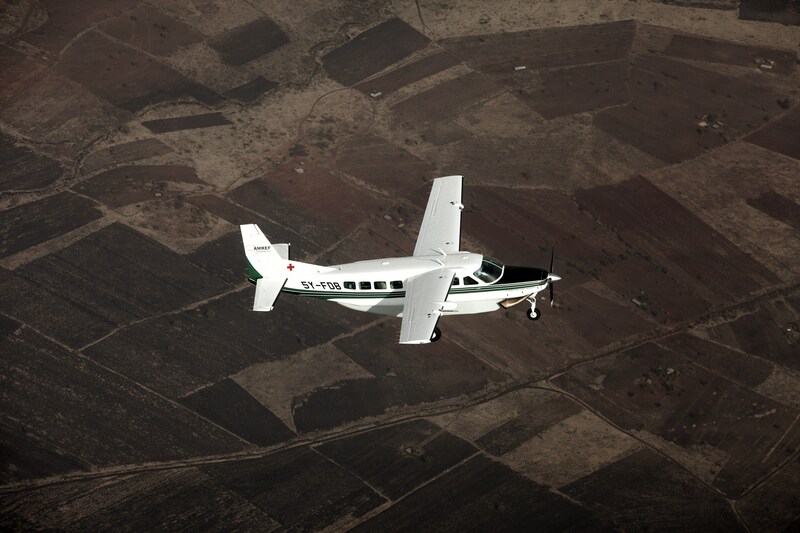 An AMREF (African Medical Research Foundation) aircraft approaching Wajir from Nairobi. Wajir, the Northeastern district of Kenya, is the second largest in the country after Turkana. The district has a population of 319,261 and an area of 55,501 km square. The main morbidity and mortality diseases in the district are malaria, URTI, diarrhea disease, intestinal worms, and malnutrition. Poor sanitation, a result of low latrine coverage is a significant problem in pastoral communities. This results in frequent outbreaks of intestinal diseases and worms. The tribes are Somali and Malakota. AMREF (African Medical Research Foundation) Doctor Charles Maina Nderitu, 38-years-old checks a patient prior to surgery at the ward of the Marsabit Hospital. Gynecologist doctor Maina lives and works in Makueni, 140 kilometers from Nairobi. He studied for 10 years in Nairobi and has volunteered his services to AMREF for two years now. One week every two or three months he joins the Outreach team: he is often sent to different locations where he examines patients, conducts surgery, and trains personnel. 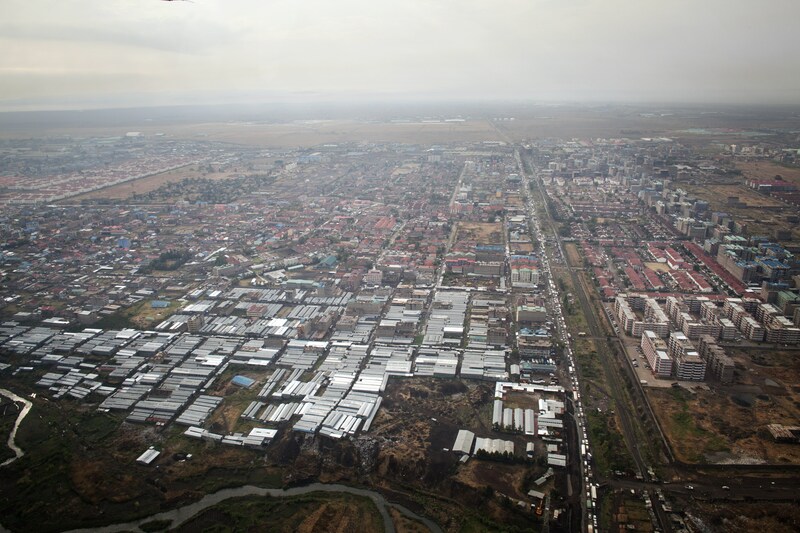 A general view of Nairobi from the AMREF (African Medical Research Foundation) aircraft approaching Wajir. Cities have grown while rural areas have in turn become emptier. The population growth rate in Kenya is 4% while the urban population growth rate is 8%, yet here too the poor distribution of services remains. Parts of the city become slums, with hardly any infrastructure or services. Nairobi’s 8% growth rate means 240,000 more people in the city every year. 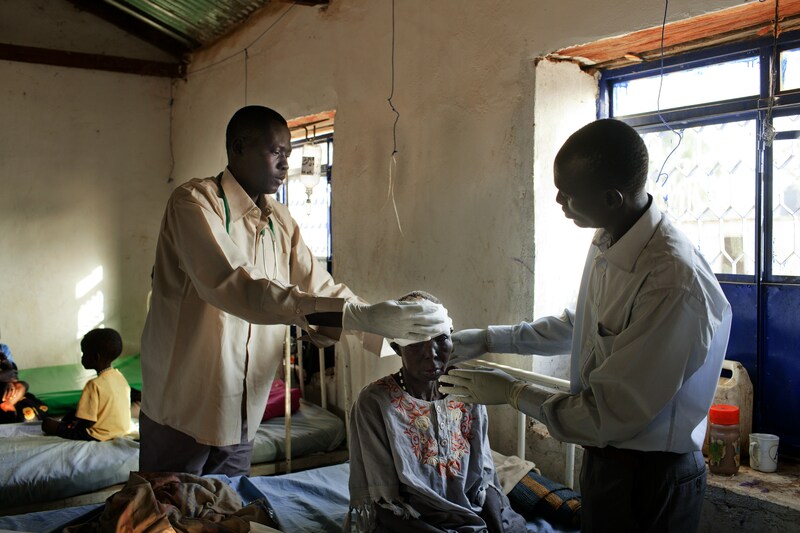 From left: AMREF (African Medical and Research Foundation) graduated Clinical Officers, James Kon Kon, 32-years-old, and Dominic Deng, 33-years-old, from Aweil County treat a patient in the IRC (International Rescue Committee) managed PHCC (Primary Health Care Centre). 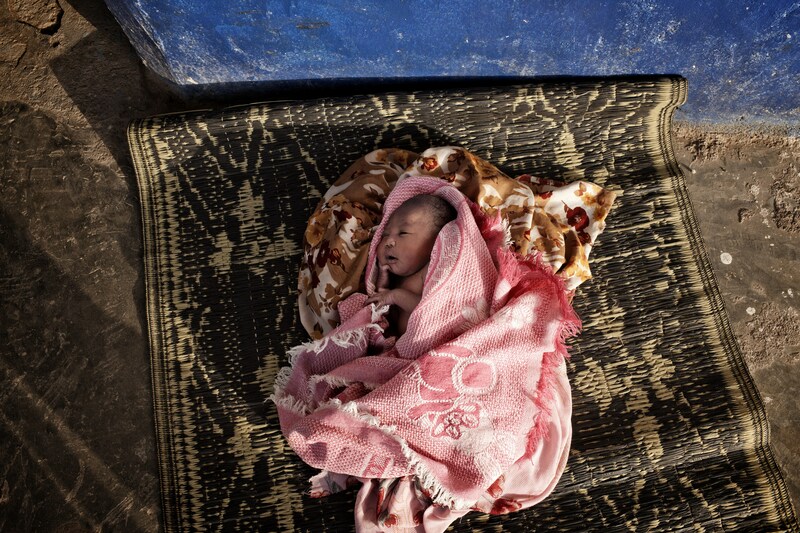 Newborn baby lies at the IRC (International Rescue Committee) managed PHCC (Primary Health Care Centre). AMREF (African Medical Research Foundation) urologist, John Wachira, 54-years-old prepares Habdi Malik, 6-years-old for surgery at the Wajir Government Hospital. 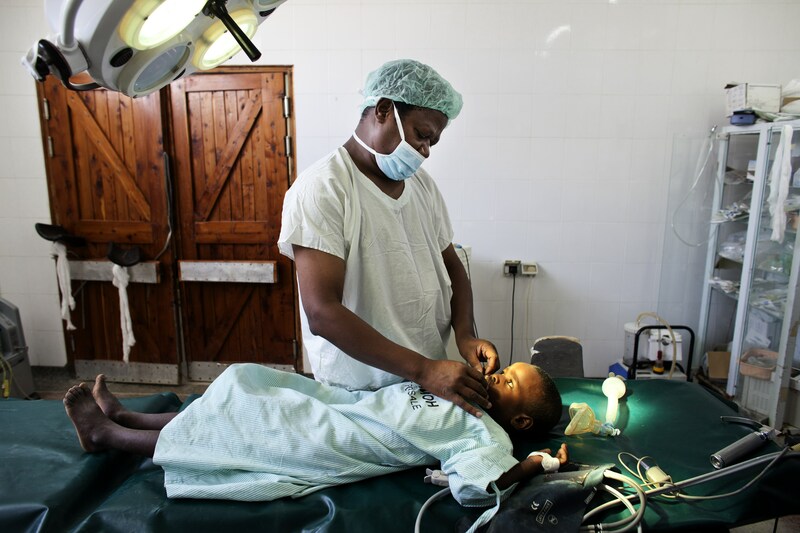 Habdi has a cleft lip, which Dr.Wachira surgically corrects to ensure the full function of his lip and oral cavity, and to give the child the full smile he deserves. Habdi is ready for the hour-long operation. 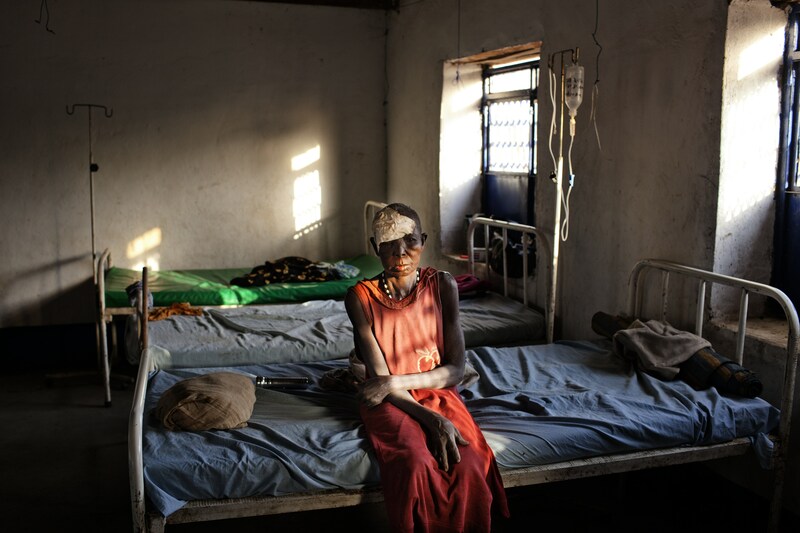 A woman lies in her hospital bed at the IRC (International Rescue Committee) managed PHCC (Primary Health Care Centre). AMREF (African Medical and Research Foundation) graduated Clinical Officer, James Kon Kon, 32-years-old, from Aweil County examines a pregnant woman at the IRC (International Rescue Committee) managed PHCC (Primary Health Care Centre) on February 5, 2011 in Malualkon, Aweil East County, Northern Bahr el Ghazal State, Southern Sudan. 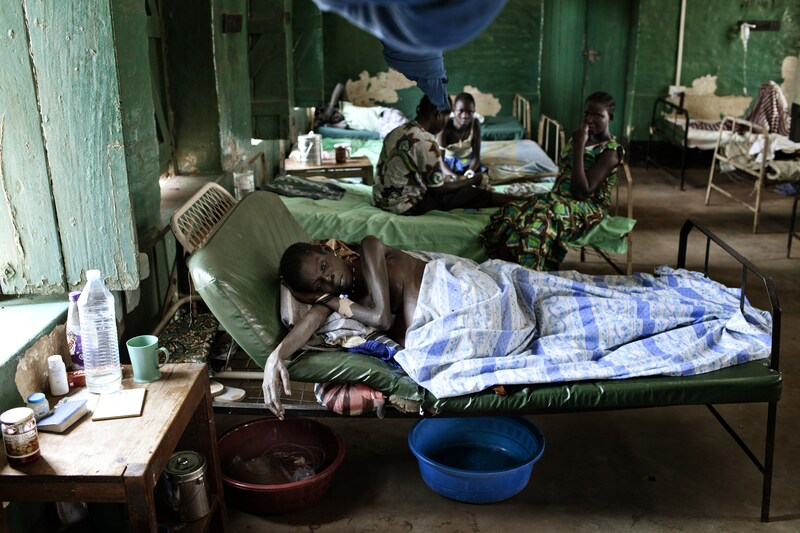 A woman lies in her hospital bed at the Yei Civil Hospital. 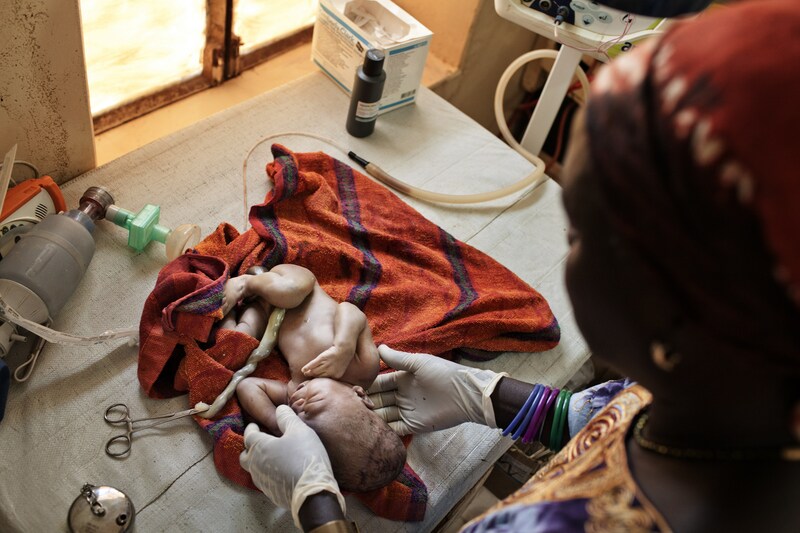 A nurse treat a newborn baby at the MSF (Médecins Sans Frontières) managed Civil Hospital. Doctor, Cyrus Kamau, 30-years-old assists a 6-years old girl after she has been raped by her 18-years-old schoolteacher at the Marsabit Hospital. A pregnant woman that was running to the hospital to bring her 6-years-old daughter raped by her 18-years-old school teacher started to moan then scream, and within a few minutes a newborn child rears its head between her legs as she was waiting for her daughter to be treated. AMREF (African Medical Research Foundation) Doctor Charles Maina Nderitu, 38-years-old prepares himself to perform surgery at the Marsabit Hospital. Gynecologist doctor Maina lives and works in Makueni, 140 kilometers from Nairobi. He studied for 10 years in Nairobi and has volunteered his services to AMREF for two years now. One week every two or three months he joins the Outreach team: he is often sent to different locations where he examines patients, conducts surgery, and trains personnel. AMREF (African Medical Research Foundation) Doctor Charles Maina Nderitu, 38-years-old perform surgery on a patient whom is believed to need a hysterectomy at the Marsabit Hospital. Later on the woman was dismissed after her abdomen was cut and open and the hysterectomy not performed due to a wrong interpretation of the echo graph. A Sumburu woman is assisted a few minutes after she gave birth unexpectedly in the corridor of the hospital. Returnees from Khartoum at the temporary settlement in Udhaba Apada area on. Prior to the referendum for the self-determination of South Sudan that took place from January 9th to the 15th, thousands of Sudanese who fled north during the 20-year plus civil war have begun returning to their native lands. 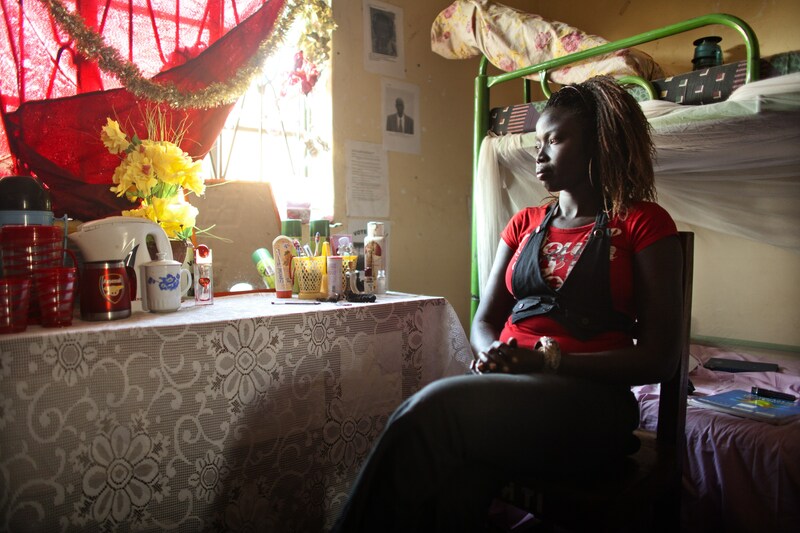 AMREF (African Medical and Research Foundation) Public Health Officer student Gloria Stella Otte, 26-years-old, from Kajo Keji County in her room at the National Health Training Institute. Women lie in their hospital beds being assisted by relatives at the Yei Civil Hospital. Hanna Poni, from Eastern Equatoria State at the Juba Teaching Hospital. 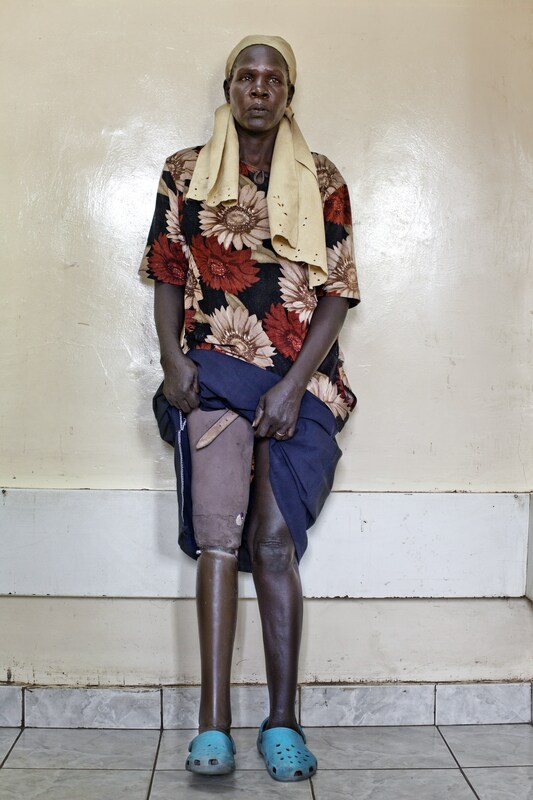 She lost her leg to a landmine, five miles from Juba, in 1992. A church patron prays during a Sunday celebration at the Catholic Church. 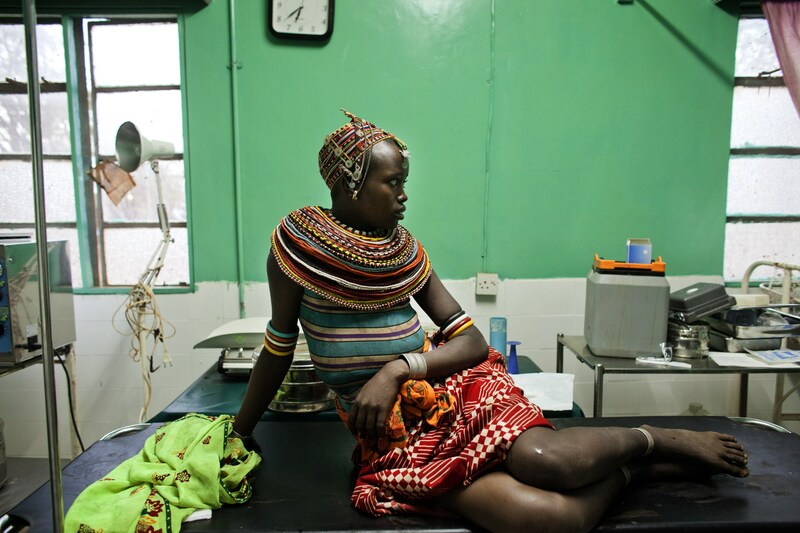 A woman that suffers of malnutrition at the AMREF managed PHCC (Primary Health Care Centre). 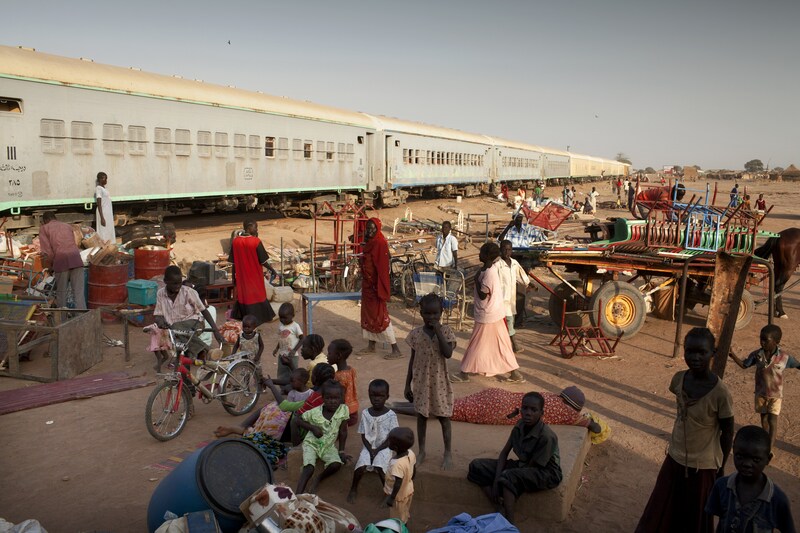 Returnees from Khartoum at the railway station in Aweil. According to UNHOCA, two trains with hundreds of government organized returnees coming from Khartoum through Kosti – Babanussa arrived in Northern Bahr El Gazal State. 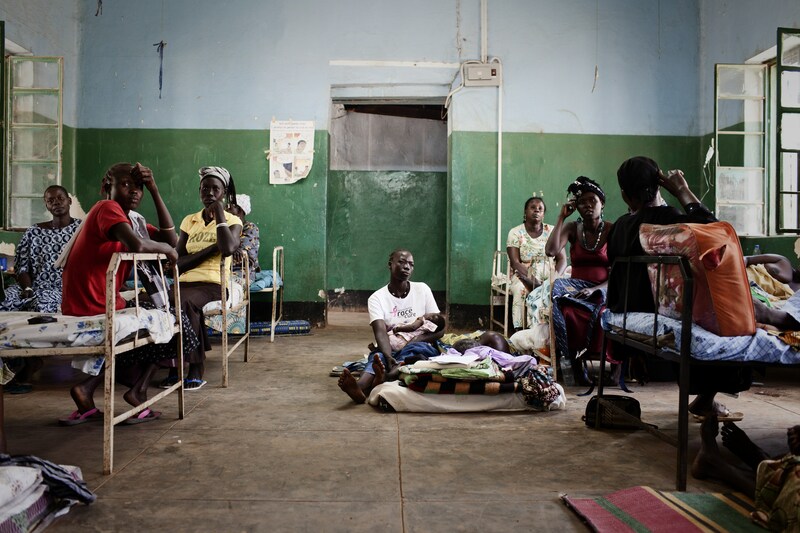 Patients wait to be treated at the Yei Civil Hospital on February 3, 2011 in Yei County, Central Equatoria State, and Southern Sudan. 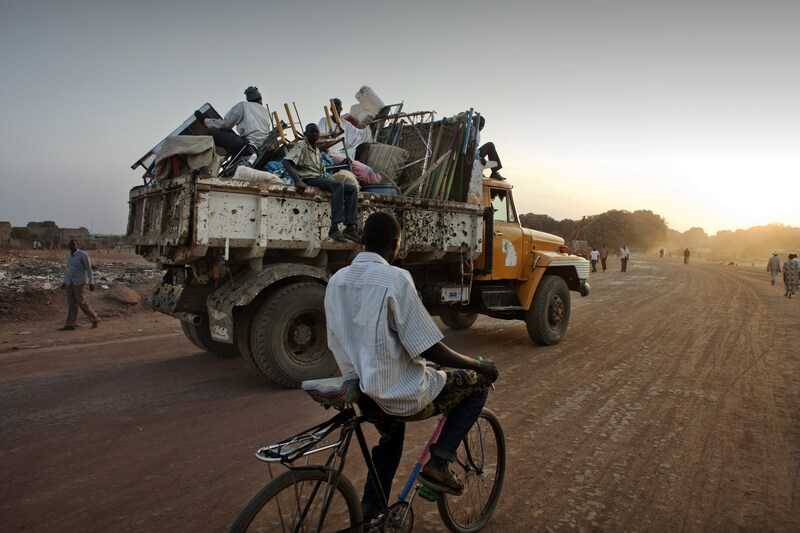 A truck loaded with the belonging of the returnees from Khartoum leaves the railway station in Aweil. According to UNHOCA, two trains with hundreds of government organized returnees coming from Khartoum through Kosti – Babanussa arrived in Northern Bahr El Gazal State. 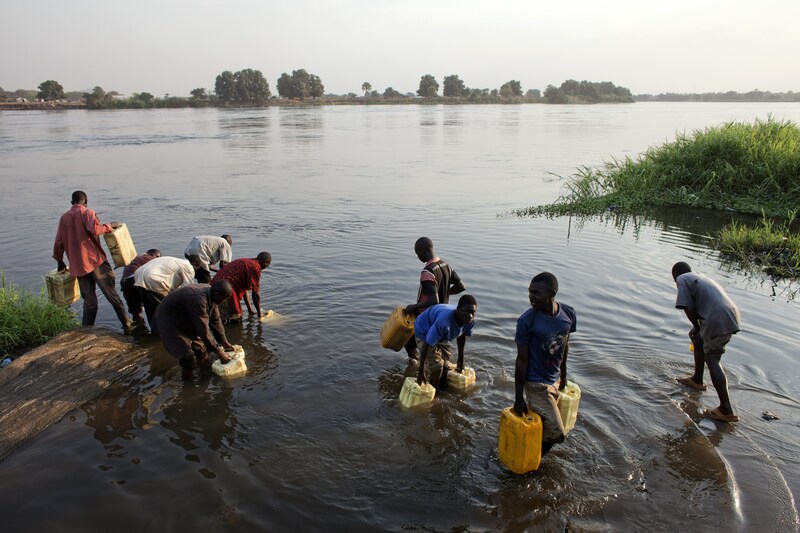 Ugandans fetch water from the Nile in Juba. Tap water is not available in most parts of Juba. Most people have a container or tanker to store water from the White Nile, which is purchased and delivered in huge water tanker lorries. 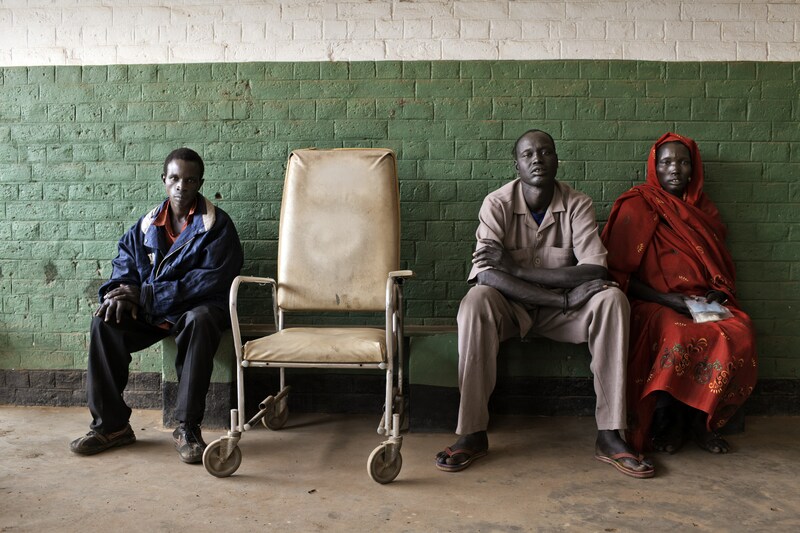 Patients wait to be treated at the MSF (Médecins Sans Frontières) managed Civil Hospital. AMREF (African Medical and Research Foundation) Clinical Officer students during their downtime at the AMREF managed National Health Training Institute. 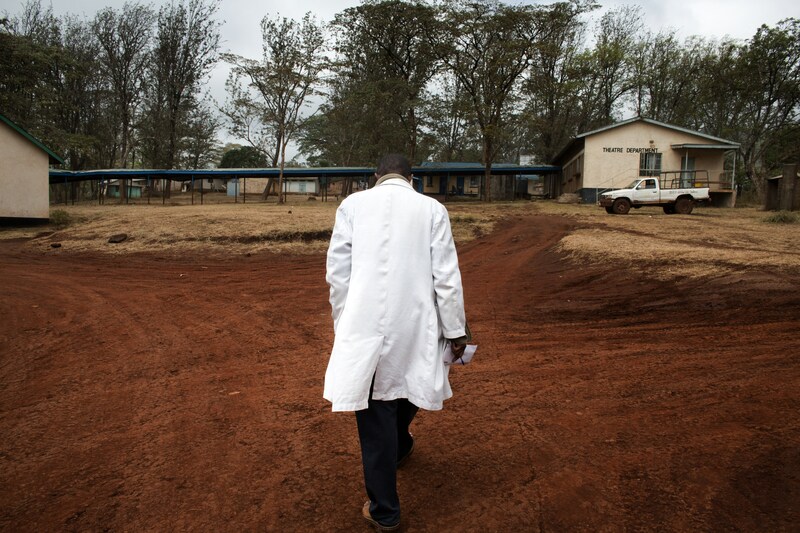 AMREF (African Medical Research Foundation) Doctor Charles Maina Nderitu, 38-years-old walks to the theatre as he gets ready to perform surgery at the Marsabit Hospital. Gynecologist doctor Maina lives and works in Makueni, 140 kilometers from Nairobi. He studied for 10 years in Nairobi and has volunteered his services to AMREF for two years now. One week every two or three months he joins the Outreach team: he is often sent to different locations where he examines patients, conducts surgery, and trains personnel.